From a theoretical perspective, alternative investments should be used within every portfolio to increase diversification. The theory goes for institutional and for private investors. For small investors, however, some alternative assets are not accessible. The goal of this study is to evaluate how alternative investments have performed compared to common assets. 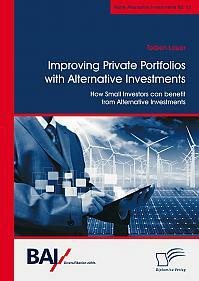 Some of the available alternative investment possibilities are already in use for many private investors. It is positive that investors buy assets that are not listed on their brokerage account. However, to have efficient portfolios, the asset allocation can be further optimized with respect to Markowitz’s modern portfolio theory. The market for alternative investments is small and lacks liquidity. Therefore, the author evaluates their usefulness in terms of accessibility and availability. The findings of this study propose that alternative investments can help to increase portfolio diversification. A portfolio comprised only of alternative investments cannot outperform a traditional one. A combination of alternative assets and traditional assets, however, can outperform the broadly used combinations of equity and debt. Textprobe: Chapter 4 The Market of Alternative Investments: 4.1 Market Characteristics and Accessibility: There clearly is a market for most of the assets previously mentioned. The crucial question for this essay however is: Are these markets accessible to private investors? And does it make sense for a private investor to get into these markets? While some of the markets are already highly liquid and accessible through exchange-traded products, others do not yet offer the possibilities for investing, especially to small investors. Preqin estimates the size of the alternative investment industry at .4 trillion in assets under management (The Alternative Asset Industry in 2015, 2016). In addition to that, McKinsey estimates the growth of alternative assets under management to be twice as much as the growth of traditional assets (Baghai, Erzan, & Kwek, 2015). Among the alternatives hedge funds build the largest share with total assets under management of .2 trillion (The Alternative Asset Industry in 2015, 2016). Yet, not all hedge funds are accessible for small investors, since many have high entry barriers. The PE market can be seen in a similar way. The size of the private equity market is estimated at 9 billion in the year 2015. (The Alternative Asset Industry in 2015, 2016). 4.1.1 Alternative Investment Benchmarks: For any type of investor, the performance of the assets is of the greatest importance. However, before getting into the assets, we should have a look at some benchmarks. This is due to the fact that, for a small investor, there is no point in doing excessive research for an asset when the asset class itself does not show a promising performance. The crucial figure to look at is not simply the return, but rather the risk-return profile of the asset classes. Since the purpose of using AIs is to reduce the risk and increase the diversification, it is of great importance to keep track of the variance of the returns. Chart 4 shows the average monthly return and the standard deviation of monthly returns of some alternative investment benchmarks in comparison to the risk-return profile of the Standard and Poor’s 500 Index. The chart proposes that, while some of the alternative investment benchmarks offer a worse risk-return profile than the S&P500, others are quite attractive to investors in terms of their performance. However, these risk-return figures are based on the benchmark performances, not investible assets. This implicates that for investible products of any AI class the risk-return tradeoff gets even worse due to order fees, management fees, and tracking errors. Still, for investors it is also good to know how the respective benchmarks perform to evaluate the performance of an asset. […]. 5 Performance Comparison to Common Assets: 5.1 Benchmarks of Common Assets: One of the main aims for this paper is to evaluate if alternatives can benefit a classical portfolio. To do so, I need benchmarks to compare the performances in the long run. Seen from a financial perspective, most alternative investments are commodity assets. This is because they do not have a constant cash flow like bonds and do not pay a dividend like equity. The benefit for the investor is simply the increase in value, just as it is for commodities. Most portfolios however, are not commodity portfolios but mostly equity and debt portfolios. Thus, the main benchmarks for those assets shall be used to evaluate the AIs. The main issue that arises here is that we will in fact have to compare price indices (for AIs) to performance indices (for debt and equity). For equity assets the two mostly used benchmarks are the MSCI World Index and the S&P500 Index. The MSCI World Index represents all stocks from 23 industrial countries. The S&P500 Index represents the 500 largest US Firms and is often considered as the major benchmark. Despite the fact that most alternative investments do not offer bond-like returns and are in many ways of entirely different nature I will still compare the performance to a bond-containing portfolio. The Bank of America Merrill Lynch Global Broad Market Index is a good estimate for the performance of debt investments. Torben Lauer wurde 1994 in Frankfurt am Main geboren. Nach Abschluss des Abiturs begann er 2013 sein Bachelor Studium an der EBS Universität für Wirtschaft und Recht im Bereich General Management. Nach erfolgreichem Abschluss des Bachelors nahm er 2016 zur weiteren Vertiefung sein Master Studium im Bereich Finanzen an der Frankfurt School auf. Schon während des Studiums begann der Autor in der Finanzbranche zu arbeiten und sammelt fortlaufend Erfahrungen im Bereich der Finanzmärkte. Insbesondere fokussiert er sich seit Beginn seines Interesses am Kapitalmarktgeschehen auf die Umsetzung der modernen Portfolio-Theorie abseits der institutionellen Investoren.